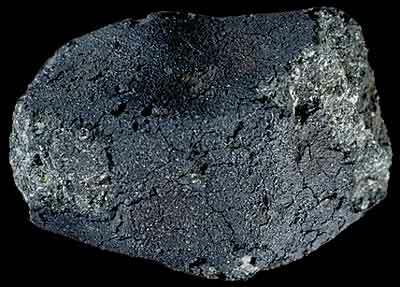 A large fragment of the Orgueil meteorite © Muséum National d�Histoire Naturelle (France). [He] caused a special drill to be constructed, which, he hoped, would remove samples from the interior of the meteorite without contaminating them with microorganisms from outside. Using sterile techniques, Pasteur inoculated an organic medium to search for growth of any indigenous microorganisms which the meteorite interior might contain. The results were negative, and have relevance today: Pasteur extracted his sample shortly after the fall of the meteorite, and was, of course, a very careful experimentalist. The possibility of biological remains in the Orgueil stone resurfaced, however, a century later. At a meeting of the New York Academy of Sciences in March 1961, Bartholomew Nagy and Douglas J. Hennessy of the Department of Chemistry at Fordham University's Graduate School of Arts and Sciences in the Bronx, and Warren G. Meinschein, a petroleum chemist at the Esso Research and Engineering Company in Linden, New Jersey, announced that they had found in a sample of the meteorite "paraffinoid hydrocarbons," similar in type and distribution to those occurring in animal products such as butter.1 From this, they concluded that "biogenic processes occur and that living forms exist in regions of the universe beyond the earth." More remarkably, Nagy and George Claus, a microbiologist at New York University Medical Center, claimed shortly after that samples from the Orgueil and Ivuna meteorites contained "organized elements" including structures "resembling fossil algae. "2 A controversy ensued in which a minority of scientists, including J. D. Bernal, supported the microfossil theory, while most, including Philip Morrison and Harold Urey were skeptical. Urey did, however, concede that it was possible the Orgueil and Ivuna microstructures were evidence for biogenic activity and that, if so, these meteorites may have come from the Moon which "became contaminated temporarily with water and life-forms from Earth early in its history. "3 By 1975, Nagy himself had come to regard the biological interpretation as a "remote possibility." In 2001, the results of a new study of material from the Orgueil carried out by a team from the Scripps Institution of Oceanography in California, the Leiden Observatory in the Netherlands, and the NASA Ames Research Center, were published.4 This study used sophisticated techniques and instruments aimed at detecting trace levels of amino acids. After obtaining a pristine piece of the interior of Orgueil, the researchers found that it contained a relatively simple mixture of amino acids, consisting primarily of glycine and beta-alanine. They also analyzed the sample's carbon isotope concentration and found that the amino acids were not derived from Earthly contamination but instead were almost certainly synthesized chemically in space. The research team then compared their results with three other meteorites: Murchison and Murray, which have been studied extensively, and Ivuna, a meteorite that fell in Tanzania, Africa, in 1938, that had not been analyzed for amino acids. The team broke the meteorites down into two classes. The Murchison and Murray meteorites were placed in a category containing a complex mix of amino acids made up of more than 70 different types of amino acids. Orgueil and Ivuna, however, were categorized with a much simpler composition made up primarily of just two amino acids. Based on the unique amino acid composition within Orgueil, the researchers were able to deduce information about the meteorite's past. Murchison and Murray are widely believed to be pieces of an asteroid, as are virtually all meteorites scientists have studied. However the paper suggests Orgueil and Ivuna show evidence that they are likely derived from a comet. The amino acid signatures within Orgueil and Ivuna suggest that these compounds were likely synthesized from components such as hydrogen cyanide, which have been recently observed in the comets Hale-Bopp and Hyakutake. This suggests that the organic material in Orgueil and Ivuna is the product of reactions that once took place in the nucleus of a comet, which, if true, would make these meteorites the first to be identified as having come from a cometary nucleus and add to the evidence that the amino acids that helped generate life on Earth may have been delivered by meteorites that were derived from the remnants of comets. In 2004, the possibility of fossilized biological remains in Orgueil was raised again by Richard Hoover of NASA's Marshall Space Flight Center (MSFC). At the "Instruments, Methods, and Missions for Astrobiology VIII" (Conference 5555) at SPIE's International Symposium on Optical Science and Technology held in Denver, Colorado, August 2-3, 2004, Hoover showed images from a freshly fractured specimen of Orgueil taken in July 2004 using the Environmental- and Field Emission Scanning Electron Microscopy at MSFC in Huntsville, Alabama. These pictures appeared to show forms in the meteorite that closely resemble mats of known terrestrial fossilized cyanobacteria such as Phormidium tenuissimum. Interestingly, on Earth, such cyanobacteria form their mats only underwater on surfaces exposed to sunlight. However, the specimen of Orgueil studied by Hoover has not been submerged since its arrival on Earth (it would have dissolved), nor was its interior open and exposed to sunlight on Earth before now. Furthermore, the putative fossils would not represent isolated single cells, but whole ecologies. The implication is that they must have grown on the meteorite's parent body before it fell. However, as in the case of other claims regarding extraterrestrial fossils aboard meteorites, this new piece of evidence is unlikely to be readily accepted by the scientific establishment until it can be rigorously shown that (a) the remains admit no non-biological interpretation, and (b) the possibility of terrestrial contamination can be absolutely ruled out. 1. Nagy, B., Hennessy, D. J., and Meinschein, W. G. "Mass Spectroscopic Analysis of the Orgueil Meteorite: Evidence for Biogenic Hydrocarbons," Annals of the New York Academy of Sciences, 93, 25 (1961). 2. Claus, G., and Nagy, B. "A Microbiological Examination of Some Carbonaceous Chondrites," Nature, 192, 594 (1961). 3. Urey, H. C. "Biological Material in Meteorites: A Review," Science, 151, 157 (1966). 4. Ehrenfreund, P., Glavin, D. P., Botta, O., Cooper, G., and Bada, J. L. "Extraterrestrial amino acids in Orgueil and Ivuna: tracing the parent body of CI type carbonaceous chondrites," Proceedings of the National Academy of Sciences USA, 98(5), 2138-2141 (2001).